An information display commemorates the crash of the Australian National Airlines plane, "Kurana" in November 1948. The memorial was erected on the 8th November 1998, the 50th anniversary of the accident. This display depicts the crash of the aircraft Kurana in this vicinity on Monday the 8th November 1948, whilst on a routine flight from Melbourne to Sydney via the Riverina. The crew comprised Captain Harry Warlow-Davies, First Officer James Barrington Keyes and Hostess Elizabeth Fry. The nineteen passengers on board were Adam Armstrong, William Cassidy, Mrs. S. Cherry, Miss Dobbie, Frank Fitzmaurice, Keith Gordon, Norman Hall, Marion Hill, John Huntly, Mary Lynch, Robert McLaurin, Marjorie McLaurin, John McWilliam, John Mather, George Osborne, Sydney Reid, Alma Reid, Brian Walton and Lindsay Woods. En-route from Melbourne's Essendon airport to Deniliquin NSW with a crew of 3 and 19 passengers, the aircraft was flying in light rain and mist when it impacted trees and crashed into a pine plantation, just below the summit of Mount Macedon. At the time of the accident, 'KURANA' was being flown by First Officer James Barrington-Keyes under the supervision of Captain Harry Warlow-Davies. In the cabin, passengers were in the care of Air Hostess Elizabeth Fry. A court of enquiry later determined that the aircraft was flying 9 nautical miles west of its flight planned track at 3000 feet, well below the areas lowest safe altitude for flight in reduced visibility, when it impacted the mist-shrouded mountain. Despite sustaining head injuries herself, Elizabeth Fry ensured all her passengers evacuated the aircraft quickly and safely. Then, with the assistance of 5 passengers, she set about extricating both injured pilots from the damaged cockpit and moving them to safety as fire broke out in the wreckage. Sadly both died from their injuries, Captain Warlow-Davies at the scene and First Officer Barrington-Keyes shortly after being admitted to Kyneton Hospital. For her bravery, Elizabeth Fry received an inscribed silver salver from the aircraft's insurers, Lloyds of London, and a medal and scroll from the Royal Humane Society. 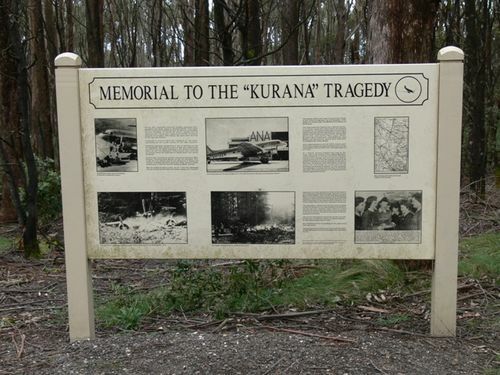 The 'KURANA' Memorial was erected on Mount Macedon on the 8th November 1998, the 50th anniversary of the accident. Twelve months later, Elizabeth Fry visited the site and presented her awards to the Gisborne and Mount Macedon Districts Historical Society for safe-keeping. Elizabeth Charlotte Smythe (nee Fry) passed away in her adopted hometown of Reno, Nevada, USA on 30th August 2011. Weekend Notes, 27th March 2018.